Las Vegas, CES Booth #8643 (January 7, 2013) – Today, Nikon Inc. announced the U.S. availability of the Nikon D5200, a camera that provides the imaginative features and D-SLR versatility needed to fulfill any creative vision through stunning imagery and Full HD video. Whether new to D-SLR shooting, or for those simply ready to step-up to a higher level of photography, the 24.1-megapixel D5200 will inspire new ways to capture with an easy-to-use interface, in-camera Special Effects and creative modes, plus the ability to share wirelessly in an instant. The Nikon D5200 will be available in late January for a suggested retail price (SRP) of $899.95* with the AF-S DX NIKKOR 18-55mm f/3.5-5.6G VR lens. "The Nikon D5200 is intended for the customer who wants to capture and share their life, their experiences and their adventures in new and original ways", said Bo Kajiwara, Vice President of Marketing, Planning and Customer Experience, Nikon Inc. "The D5200 features Nikon's latest innovative technologies along with an easy-to-use feature set that enables users to unleash their creativity, and truly test the boundaries of a photographer's imagination." Vari-Angle LCD - The high-resolution, 921,000-dot 3-inch LCD screen swivels and rotates at a variety of angles, and is viewable at 170 degrees. This makes it easy to capture images and HD video from creative angles such as above the crowd or down low from a toddler's perspective. Users can even swivel the LCD screen for creative and fun self-portraits. In-Camera Special Effects for video and still images - By selecting the Effects option on the Mode Dial, users can apply a wide range of creative filters and effects for both photos and HD video. Modes include Selective Color to visually highlight up to three selected colors within a monochrome scene; Color Sketch to create a vivid drawing from a scene; Miniature effect to make a scene appear as a miniature model and Night Vision to enable images and video in very low-light by increasing the camera's sensitivity. Users can also enable modes to emphasize silhouettes or create color effects with high-key and low-key images and video. These effects can be applied prior to shooting the photo or video, or can be applied post-capture for photos through the retouch menu. Creativity has never been easier - The D5200 features an enhanced graphical user interface (GUI) that makes it easy to visualize camera settings for optimal results. Additionally, users can enable other visual effects including High Dynamic Range (HDR) and six settings of Nikon's Picture Controls to creatively and automatically manipulate tone and color for striking images and HD video. EXPEED 3 image processing - Nikon's most recent image processing engine, dubbed EXPEED 3, drives the rapid response and swift performance of the camera, while maximizing energy efficiency, reducing image noise and delivering true-to-life colors. 39-point AF system with wide area coverage - The D5200 features Nikon's quick and accurate 39-point AF system to help users create tack-sharp images for a wide variety of subjects. The Multi-CAM 4800 DX AF sensor works in tandem with the Scene Recognition System to accurately acquire and track subjects throughout the frame. Users can lock-on to fast moving subjects throughout the frame using 3D tracking to create sharp images of fast action, or use one of the other modes including single point AF, Dynamic AF and Auto-Area AF. When in Live View or recording video, contrast detect AF quickly acquires, and can even track focus through the frame. While the Nikon D5200 is capable of capturing amazing images and HD video, it also enables the user to simply and quickly share stunning imagery with friends and family. By utilizing the optional WU-1a Wireless Mobile Adapter, the connected user can easily share photos taken on the D5200 to a supported smartphone or tablet. 2 The Nikon Wireless Mobile Adapter Utility application is available free of charge on Google Play™ for Android™ 1 devices or from the App Store™ for the iPhone or iPad. 3 When using the application, photographers can wirelessly transfer images from the camera to a mobile device, and even remotely control the camera from up to 49 feet. 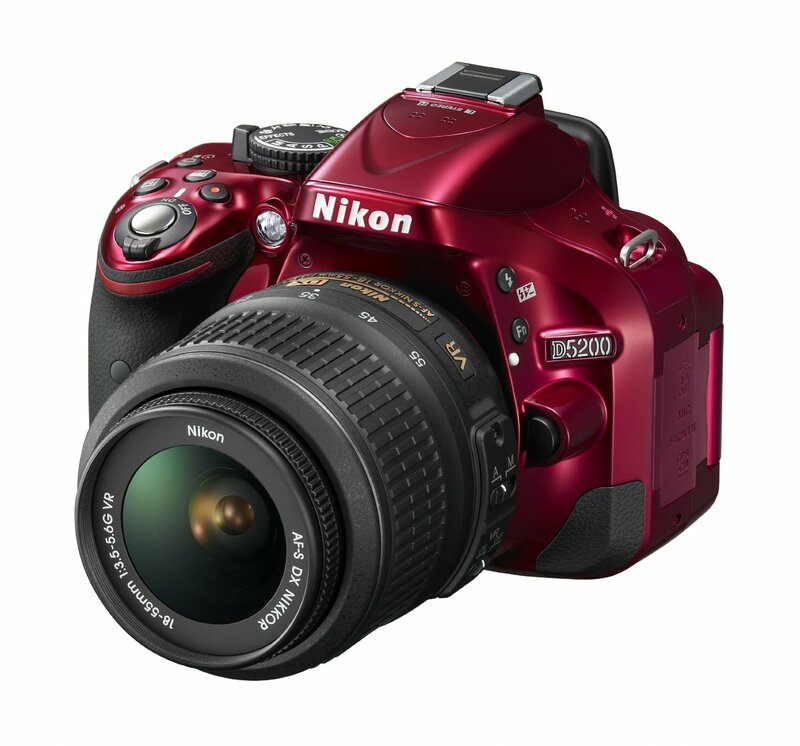 For those wanting to expand their creative vision with video, the D5200 D-Movie HD video mode is capable of capturing Full HD 1080p, with the option to apply Nikon's Creative Effects. This feature lets users take advantage of modes like Selective Color or Color Sketch to create truly customized movies. By simply pressing the dedicated video record button, movies are recorded at 1080/30p, or at 60i for optimal playback on many HDTVs when connected to the HDMI output. For the first time in a Nikon HD-SLR, users have the ability to record stereo sound through the internal microphone or attach an optional external microphone, such as Nikon's ME-1, through the dedicated microphone terminal. The creative potential for the D5200 is unlimited when combined with the versatility of Nikon's legendary NIKKOR optics and powerful system accessories. Compatible with Nikon's dedicated DX-format lenses and more than 50 FX-format lenses as well as Nikon's Speedlight System, the Nikon D5200 puts the ability to create stunning images and HD video at the user's fingertips.